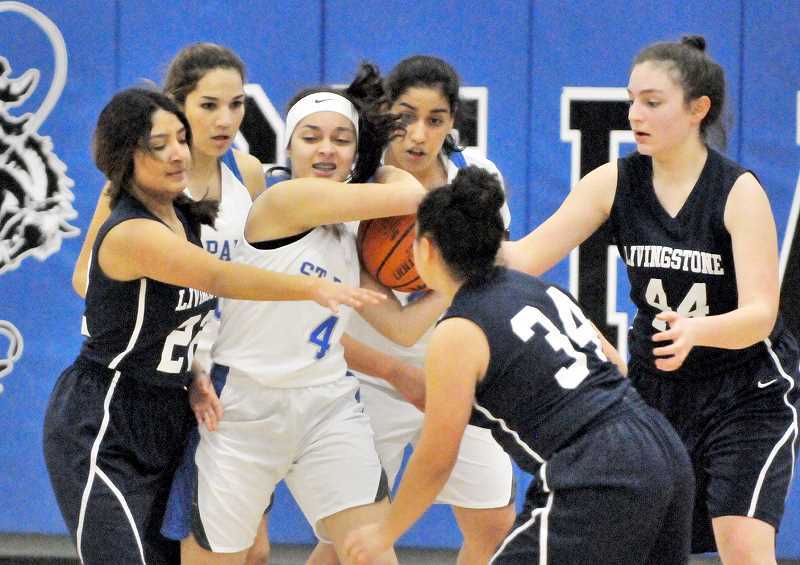 St. Paul girls basketball doesn't have to play a perfect game to win. It doesn't even need to play a good game. When a team is this dominant on the defensive end, you can afford a few mishaps on offense. Despite a slow start scoring the ball, the Bucks (22-0, 14-0 Casco League) demoralized Livingstone Adventist 68-16 on Jan. 31. Another league game, another comfortable victory. "We were a little up and down tonight," coach Dave Matlock said. "But we played our great defense and were able to bust it open. We just want to be a little more efficient down the stretch against better teams." Midway through the first quarter, the Bucks led 8-0, but turnovers and missed opportunities in the paint kept the score from getting even further out of hand. St. Paul was playing comfortable, though, and never seemed to doubt the result – even when the Lions scored. A strong finish to the first frame made it 20-7 Bucks after eight minutes. 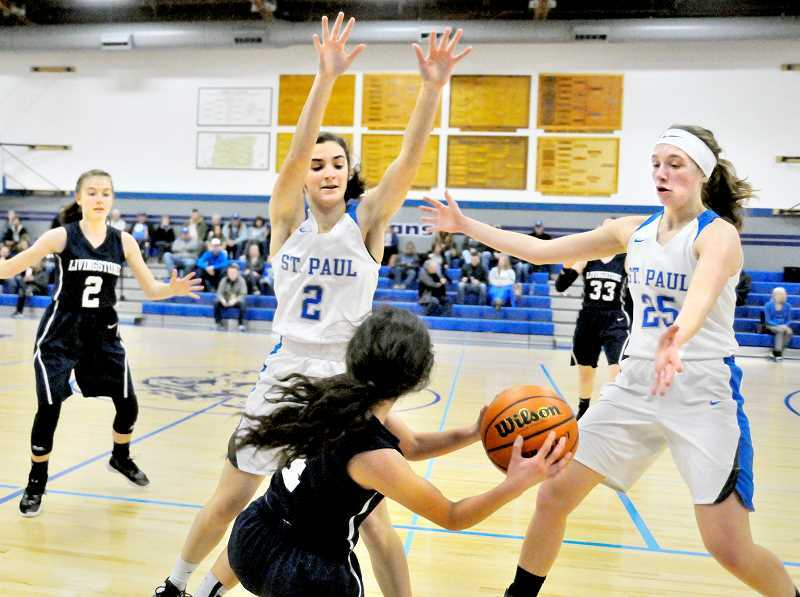 The second quarter saw St. Paul continue to put the defensive clamps on, holding Livingstone to four points en route to a 36-11 halftime advantage. It would only get worse for the Lions as the game pressed on. After three quarters it was 54-14. The Lions managed just two points in the final quarter as the Bucks ran away with a 52-point victory. A big part of St. Paul's defensive success is its half court trip, which throws teams out of their rhythm on offense and often forces dozens of turnovers. The Bucks sag back on the help side and anticipate where a double-teamed player is going to throw the ball, leading to myriad breakaways that result in layups. Games like the one against Livingstone are less about a result and more about development, Matlock said. The Bucks need to be sharp and execute well against lesser teams, he said, if they want their play to carry over to games against worthy opponents. One area of practice is making open jump shots when its best players are double-teamed. That wasn't always the case against Livingstone, so Matlock said his team needs to improve in that area. "Those individuals are going to draw a lot of defense, so those kick outs are going to be wide open," Matlock said. "Those are shots we need to knock down if we're going to beat better teams. They're going to double our best players in the post and force us to beat them with our jump shooting." The rest of the regular season should go as planned and the Bucks will likely finish 25-0. They only have three games remaining, including a played Monday that will be reported on next week. C.S. Lewis Academy forfeited its two games against the Bucks, including one slated for Tuesday, due to lack of personnel, making the final two weeks a bit lighter in terms of workload. Less games means more time to practice, which Matlock said he's excited about. A bout with Perrydale likely looms Feb. 16 in the Casco League championship. The Bucks have already secured their spot in the game, and it will be up to the Pirates (17-5, 12-2) to take care of business in the earlier rounds. The winner of the Casco League title will play one game before traveling to Baker City for the state championships. The loser will have to draw out a path that includes two victories prior to traveling east. In the coming weeks, St. Paul plans to bring the junior varsity boys team into its practice to simulate the physicality of Perrydale and other top opponents in the 1A classification. Matlock said it is necessary if they want to capture a state title. "That will prepare us for not making any soft passes, being physical and whatnot," he said. "You can't simulate that level of physicality with your backup girls. That is going to get us ready." St. Paul has Crosshill Christian and Falls City remaining on its regular season schedule on Friday and Monday. The Casco League title game will be played on Feb. 16, after which state playoffs begin. According to Matlock, this group is more prepared for a title run than any in recent memory. They are coachable, athletic, talented and mentally tough, he said. Most importantly, they haven't lost yet. Beating up on lowly Livingstone is one thing, but putting together the kind of performances like they have had against teams like Joseph and Perrydale is another challenge. The Bucks appear to be ready based on recent play. "What separates this group from others I've had in the past is their willingness to stick with it," Matlock said. "That Joseph game was a perfect example – we found a way to win. That's a mark of a team that's hard to beat. We just don't quit."